The construction of the Entertainment and Sports Arena (ESA), located in the heart of Washington DC’s Ward 8, is having a significant, positive impact on the local community. The ESA project has employed 177 Washington DC residents, of which 72 are from Wards 7 & 8. This represents wages of $1.8M, or 42% of the non-DC resident wages! In addition to the utilization of the existing DC workforce, our team has worked diligently to ensure that this project serves as an opportunity for new careers. New hires and apprentices reap some of the greatest benefits as they begin in this exciting career track. To date, there have been 89 District resident new hires on this project, and DC Apprentices have put in nearly 30,000 hours of work. Over 65% of the project was constructed by DC businesses, including major trades like Earthwork & Utilities (JJ Prime, Ward 7), Structural Concrete (Saxon Construction, Ward 8), Masonry (JPN Masonry, Ward 3), Miscellaneous Metals (Moxy Miscellaneous Metals, Ward 8), Mechanical & Plumbing (R&R Mechanical, Ward 5), Roofing (HRGM, Ward 8) and Glass/Curtain Wall (Innovo Construction, Ward 4); and finish trades like Drywall (P&D Contractors, Ward 4), Painting (Precision Wall Tech, Ward 8), Tile (Koydol, Ward 4), and Flooring (B&B Floor Services, Ward 7). The Entertainment and Sports Arena is a 4,200 seat arena on the St. Elizabeth’s campus in Congress Heights. 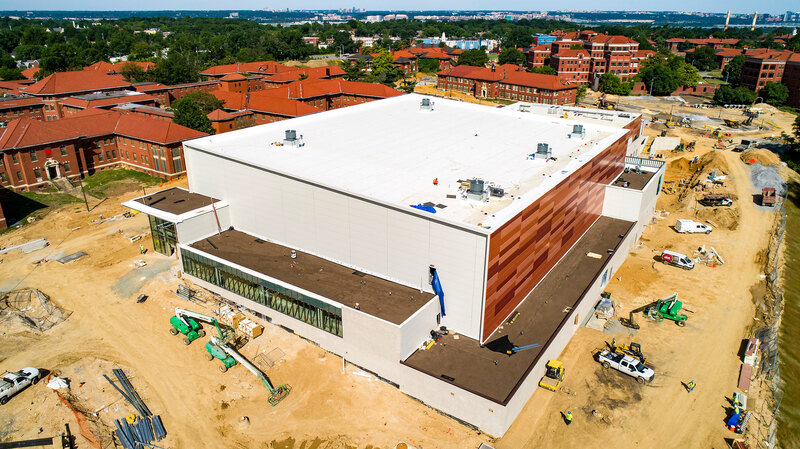 Built by Smoot Gilbane Sports, A Joint Venture (SG), this arena will be owned and operated by Events DC and will host the first WNBA-dedicated facility in the league for the Washington Mystics and as a state-of-the-art training center for the Washington Wizards. It will also serve as a premier entertainment venue for concerts, e-sports tournaments, boxing matches, and more. Go Mystics/Wizards/Go-Gos!